Legend has it that Kristin Holte once did three rounds of Murph, and now, the 29-year-old from Norway is heading back to the CrossFit Games for the second time, after finishing 16th in 2014 and winning the Triple Three event. At around 5ft 4 inches tall (162 cm) and 58kg (128 lbs), the former track and field athlete fits the bill for a well-rounded Regionals Crossfitter. But Holte is anything but average. During interviews she is modest, but on the Meridian Regionals floor, Kristin Holte was one of only 10 women in the world to complete the chipper of event 3. Holte (pronounced hol-teh for us non-Scandinavians) is the only non-Icelandic female athlete going to the Games in 2015 from the Meridian Regionals. 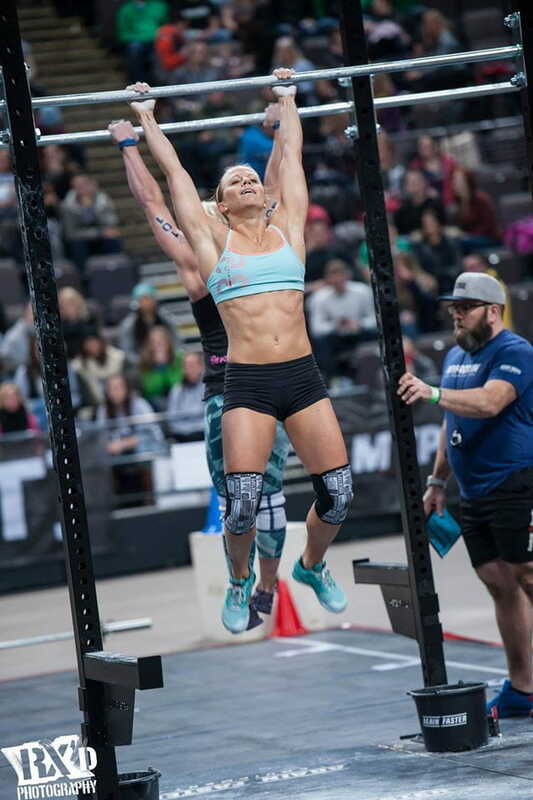 Kristin Holte was one of only 10 women in the world to complete the chipper of event 3. Not only to finish, she also holds the world record for this workout. Training out of CrossFit Oslo and in San Diego at CrossFit Invictus with world-renowned coach CJ Martin, Kristin has been studying what is becoming know as the ‘Invictus Mindset‘, a mental toughness regime which could go part-way to explaining why Holte says burpees are one of her all-time favourite movements. We caught up with Kristin to get her thoughts on qualifying, training, mobility and pizza. You’re one of the Meridian’s top 5. That’s a pretty cool feeling, no? Yes, it`s a really good feeling. With the fierce competition in the Meridian region this year, I was really happy to get one of the top 5 spots. You were consistently strong throughout Regionals, during a weekend that tested everything. How are you feeling about your overall strength and fitness, ahead of the Games in July? I have worked hard on my weaknesses this year, so I feel like a more complete athlete. After I started working with CJ Martin from Crossfit Invictus, I have improved significantly in my overall strength and fitness. I feel stronger than ever, both physically and mentally. What would you like to see at the Games this year? I am hoping for a really long and tough event like Camp Pendleton from 2012. I would also like to see lots of burpees, since they have been missing during both Open and Regionals this year. Event 3 at Regionals. You bossed it! Not only did you finish first, you were one of only a few in the world to finish at all. How did you feel before, during and after that one? Thank you! I knew coming into the event that it would be in my wheelhouse, I liked all of the movements and I loved that it started with a long run and ended with 100 box jumps. I knew that I could finish it, but I didn’t have my eyes on the event record. I stuck to my game plan the whole time, focused on one thing at a time, and when I got to the box jumps it was all about keeping the other girls behind me. The most memorable moment from this event was the amazing cheering from the crowd every time I moved the box. It gave me goosebumps and for a moment there, I could feel the crowd lifting me over the box. That is a moment I will never forget. The amazing cheering from the crowd every time I moved the box gave me goosebumps. I could feel the crowd lifting me over the box. Lots of people have said that the Meridian region is the toughest, especially for the women. Do you think so? Yes, I do. If you look at the results compared to the rest of the world, you see that there are 5 women from the Meridian region within the top 11. What is your favourite Rocktape must-have item? The RockGuards are great for rope climbing. At Regionals with a total of 27 rope climbs that really helped me out so I didn’t have any burns on my shins. My other favourite Rocktape item is the pink camo tape, I love the color and I use it every day for training, either for my thumbs, wrists, back or wherever I need some extra protection or support. What’s been your favourite lift recently? What is your approach to mobility? This year has been an eye opener to me regarding mobility. Due to several minor injuries, I have been forced to think differently this year. I have added about 1 hour of mobility to my training every day, and I am convinced that this will help me avoid injuries in the future. Tell us about your studies as a nutritionist. What are you focusing on? I finished my Masters degree in clinical nutrition in December 2014. I wrote my Masters thesis on different kinds of whey proteins and their effect on muscle protein synthesis in young and elderly people after a bout of resistance exercise. My main focus as a nutritionist is how we can improve health in the general population and how athletes can reach their full potential by optimization of their diet for training and competition. Is it ok to have banana in curry? What about sultanas? Sure, if it tastes good I can eat everything! Minced meat, ham and chorizo – Triple Meat. Mat Fraser eats Ben & Jerry’s with full-fat milk. What’s your favourite ice-cream flavour? I like plain ice-cream – vanilla or strawberry. “Are you with me” by Lost Frequencies. Love that song! Kristin Holte will be competing at the 2015 CrossFit Games in Carson California from 21 July.